Completely protected by United States patents. The Electrified Cover Safeguard is the stray voltage warning which alerts the public and workers when a manhole, light pole or utility box is accidentally electrified. Below are just a few of the many examples of how Electrified Cover Safeguard technology can be used to retrofit existing manhole covers, casements, lamp poles, luminaires and utility boxes. If you would like to incorporate a real time stray voltage warning system into your existing product line, please contact us for patent licensing information. Model LP2 is designed to retrofit existing utility poles. It creates a visual and audio warning while at the same time contacts the utility. 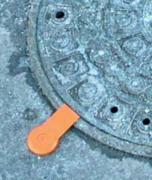 Model MH7 is a fast installing light / audio warning device designed to retrofit existing manhole covers. 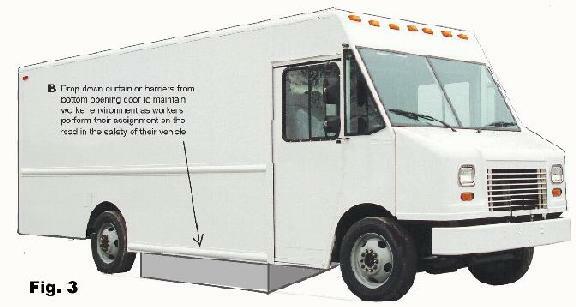 Models DG4 through 12 are units designed for farm, factory, railroad and areas requiring deep grounding. These extra rugged units provide a visual and or audio warning and some units are capable of contacting the central office of the utility. Model GR3 is designed to provide a visual and or audio warning for gratings but can also be used on manhole covers, particularly in cases of relatively poor grounding, such as cement casements. Model MH3 is an advanced stray electric warning device designed to provide a multiple visual warning and audio warning while at the same time communicating with the central office of the utility. Above are just a few of the countless styles of stray voltage warning systems which can be made to order for your specific needs. The Electrified Cover Safeguard can be built into smart electric meters or conventional electric meters. The Electrified Cover Safeguard is the patented warning concept and technology which produces a visual and/or an audible warning to alert the public, workers, and pets of a potential electrocution hazard from stray voltage. These warnings also assist utilities and municipalities to quickly locate and repair dangerous electrified manhole covers, utility boxes and light poles. The patented concept and technology of a visual and audible stray voltage warning system and contact voltage warning system can be incorporated into a light pole, luminaire, manhole cover, casement or utility box. 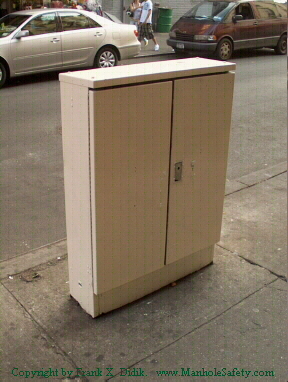 In addition existing poles, luminaires, manholes, casings and utility boxes can be retrofitted with auxiliary Electrified Cover Safeguard units, as shown below. The warning system can also be constructed to communicate with the utility and indicate exactly which manhole, utility pole or utility box has become electrified. If you are a manufacturer of manhole covers or casements, light poles, luminaires or utility boxes and you would like to incorporate a real time stray voltage warning system and contact voltage warning system into your existing line, please contact us regarding patent licensing details. Is an essential safety concept and technology for all manhole covers as well as lamp poles. lamp heads, junction boxes and other electric utility devices. Indicates in real time, when a manhole, lamp poles, lamp heads, junction boxes and other electric utility devices is accidentally electrified. 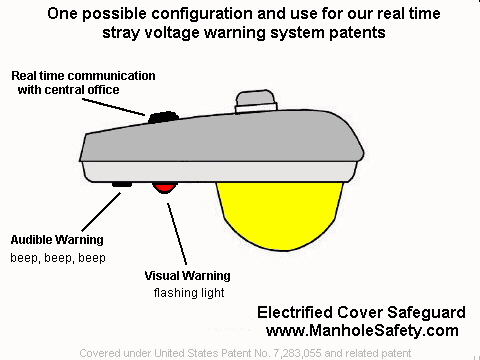 Uses sound and or a visual warning, such as a light to indicate that the manhole is electrified. Communicates with the utility central office to indicate exactly where and what has become dangerously electrified as a result of stray voltage. Electrified Cover Safeguard devices are designed to be extremely rugged, waterproof and function without maintenance for years. If you are a manufacturer of manhole covers, light poles, lamp heads, or utility boxes, the Electrified Cover Safeguard patented real time warning concept can be licensed so that a real time stray voltage warning can be incorporated into your product line. Designed to be cost effective and financially viable for utilities. Over the past three years, almost 50 million dollars have been awarded by the courts to individuals and companies as a result of stray voltage issues. The Electrified Cover Safeguard real time stray voltage warning concept and technology can minimize your exposure to this potential liability. The manhole cover, casements, light poles, lamp heads, and utility boxes, can be made to be made to glow when accidentally electrified. The Electrified Cover Safeguard patented system and technology can be licensed with or without a warning audible warning. An audible warning sound is important since it acts as a warning for the visually impaired, may assist in preventing electrocution of pets and acts as a backup system for the visual blinking indicator. There is little chance for a false positive since the unit is activated by the stray voltage. Can potentially limit the liability costs to a utility. Not to use it may in the future, be construed as negligence. This device can save lives of people and pets. Existing manhole covers, lamp poles, lamp heads, and utility boxes, can be retrofitted in a matter of a few minutes by servicemen. Can also be used to determine if street lamp poles, lamp heads, transformer boxes and other metallic utility items are electrically charged. The Electrified Cover Safeguard is a must have for all utilities, railroads, municipalities and any other entity where a stray voltage warning system and contact voltage warning system is necessary. Custom, made to order units can be provided to your utility, at a minimal cost to retrofit existing street lamps, lamp heads, manhole covers, casements, and utility boxes, or you can license the patent technology to incorporate the Electrified Cover Safeguard concept into your existing product line. Contact us if you wish to license Electrified Cover Safeguard so that you may incorporate this technology into new manholes and utility pole product line. 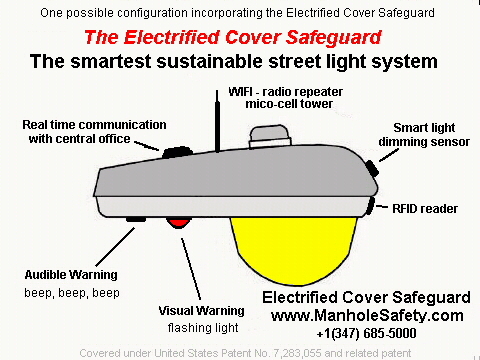 The Electrified Cover Safeguard can be incorporated to create the most advanced sustainable street lighting system including WiFi, police and fire department radio repeater, micro cell tower, RFID reader, all at the same time providing real time stray voltage and contact voltage monitoring with a real time, on site visual and audible warning. A safety must for all utilities, railroads and subway systems. ABC-TV ran a very nice story on their nightly news program covering the Electrified Cover Safeguard. Segments of the show can be seen on their website. We encourage manufacturers of manhole covers, casements, light poles, lamp heads and utility boxes to incorporate visual or audible stray voltage warning systems into your existing and new products. Please contact us for patent licensing details. We are very impressed by the positive interest shown for the Electrified Cover Safeguard patented real time warning concept shown by electric utilities, phone and cable companies and municipalities. As this is being written, various versions of the unit are being tested by utility. Further, we are negotiating patent licensing agreements with several manufacturers of manhole covers, light poles and others. If you would like to have someone contact your office regarding patent licensing information, kindly send us an email at technical@manholesafety.com and we will contact you by telephone. Electrified Cover Safeguard is a must for public safety and may potentially limit your liability in stray electric issues resulting in injury. The Electrified Cover Safeguard units shown on this site are designed to quickly retrofit existing manhole covers and utility and light posts. Depending upon the model, the manhole cover or utility pole can be retrofitted between 4 minutes and 35 minutes. For new installations, Electrified Cover Safeguard units can built into the structure and the patent covering all real time, on site, stray voltage warning systems can be licensed by manufacturers and utilities. Shown are just a few of the countless styles of stray voltage warning systems which can be made to order for your specific needs. We encourage manufacturers of manhole covers, casements, light poles, lamp heads and utility boxes to incorporate visual or audible stray voltage warning systems into your existing and new products. Please contact us for patent licensing details. Without the Electrified Cover Safeguard, there is no way for the pedestrian to determine if the lamp pole poses a shock hazard. Completely protected by United States patent. Please contact us for complete details on the numerous advantages that the Electrified Cover Safeguard can provide for your company including how installing the Electrified Cover Safeguard can potentially reduce your liability and ultimately save your company money. Stray Voltage. Stray Voltage warning systems to warn the public when street lights, manholes and utility boxes becomes accidentally electrified. 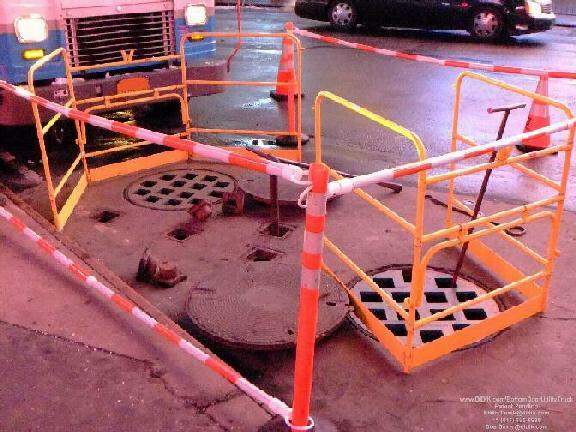 Man hole cover safety, utilities, street covers, metal surfaces, electrified, electrocution, hazard, danger, prevention, aid, cobra head, cobra heads, lamp poles, street lighting, street furniture, zap-alert, zap alert, LED, LED's, HPS, High Pressure Sodium. Contractor, engineer, installation, solid state ballast, stray voltage indicator lamp. Cobra head luminaire, solid state ballast, 120 vac, 220 vac, division, street lighting, ul. Die cast aluminum, housing, slip fitter, bracket, slipfitter, mounting, device, zinc. Weep holes, drainage, alloy, composition, astm, luminaires, nominal, amperes, line operating amperes, wattage. Line voltage variation. Efficiency, Test, testing, tests. wire, twist lock, tin plated. Steel, double wiping, photometric. Data, diagrams, rectangular, candlepower, candle power, isocandela, verticle, lateral, control, isolux. receptiacle, miscellaneous, electricity, east 12 street, Jodi Lane, Public Service Commission, utility, Con, NYC, New York City, Manhattan, Edison, Brooklyn, East Village, Pet, Pets, dogs, cats, conductor, conducting, local, law, public safety. Sustanable City Light, LED Down Light/LED Cabinet Light/LED Ceiling Light, LED Down Light. LED Tube Light, LED solar garden lights, light steel keel, Moving Head Light. Moving Head Computer Light. LED Flex-Neon Light. Color Change Light. Plastic Light and LED Downlight, Ceiling Light, Recessed Light. LED Microscope Light, Outdoor LED Flood Light and LED Ceiling Light. Stage Light/DJ Light/Disco Light, Masthead Light. Also LED Tube Light, LED head magic Light. LED Down Light Series, SMD LED Spot Light, Spotlight, LED Spot Light plus Point Light Source. LED Ceiling Lamp/Light, Solar Yard Light, LED Spot Light. LED Tube Light, LED Bulb/LED Bulb/LED Lamp/LED Light and LED Battery String Light. The Electrified Cover Safeguard can be incorporated and used with all of the above lightng and luminars in all voltages and watts including 7w, 10w, 3w and more. It is a must to control unwanted contact voltage. Self Stick Stray and Contact Voltage Detector Patent. Every year, thousands of people sustain electric shocks which in some cases, can injure or kill. The Self Stick Stray and Contact Voltage Detector is the solution.